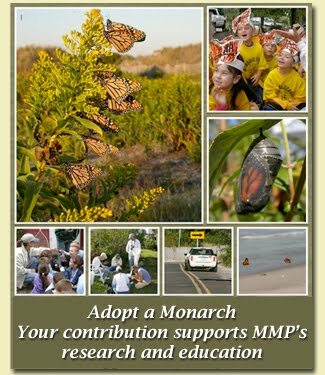 Members of the Monarch Monitoring Project have noticed a significant increase in the numbers of monarchs flying over the dunes at Cape May Point this morning. Thirty-nine monarchs were counted on the 9:00 am census, which calculates to well over 100 per hour. Seaside goldenrod is starting to bloom along the dunes, too, and this native plant is an excellent nectar source for adult monarchs. If you're around Cape May Point today, I suggest a visit to any of the dune crossover trails. Watch for monarchs on the goldenrod and up in the sky. Flower gardens around the Point might also see a significant increase in monarchs today. We don't know yet if this will be a small, short-lived surge in monarch numbers or if it's the beginning of a big push, but we'll be sure to report back before the end of the day with more information. Monarch feeding on seaside goldenrod, Solidago sempervirens. Only 2 more tagging demos of the 2013 season! Where do the monarchs go when it rains? The wrong wind direction ... again.